Lushin Dubey: India’s answer to some of the legendary stage actresses of the British theatre like: Sarah Siddons, Mrs. Jameson and Peggy Ashcroft, Lushin Dubey did her Masters in History from Lady Shri Ram College for Women (LSR), University of Delhi and then masters in Science in Childhood and Special Education in the US. From there began a long association with children and soon she started, "Kids World" with her cousin Bubbles. The two woman army did everything from casting, set design, choreography, direction and produced evergreen favorites like Jungle Book, Peter Pan, Jesus Christ, Superstar, Les Miserables and the epical play Gautam Buddha. A theatre artist with an enviable repertoire, she was instrumental in starting work with a group (United Players Guild) staging Shakespearean plays. 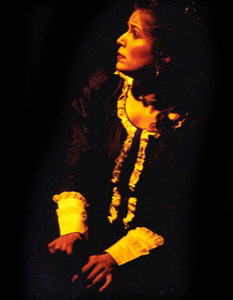 She acted in the lead as Isabella in Measure for Measure; ‘Lady Macbeth in Macbeth, Portia in The Merchant of Venice and as Desdemona in Othello. She co-produced ‘Othello in Black and White’ which returned from Edinburgh, winning the "Edinburgh Fringe First".